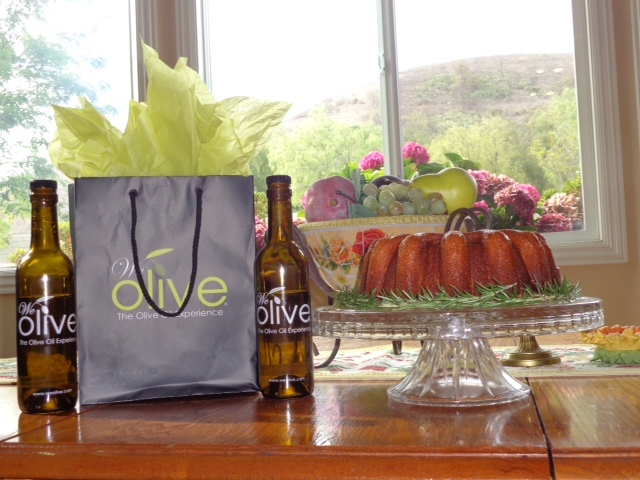 This Discover Cooking with California Olive Oil Recipe Contest submission comes from We Olive Thousand Oaks customer, Kim Simons. Kim’s cake uses buttery, We Olive Mission Extra Virgin Olive Oil and We Olive Peach White Balsamic Vinegar in the tangy glaze. 1. Blend together dry ingredients: 1 cup all purpose flour, 3/4 cups polenta, 2 teaspoons baking powder, 1 teaspoon salt. Cream together: 1/2 cup room temp butter, 1 and 1/2 cup sugar, 1cup We Olive Mission Extra Virgin Olive Oil, 1 teaspoon vanilla extract, 2 tablespoons finely ground fresh rosemary, juice of 1/2 lemon, 5 eggs + 2 egg yolks. 2. After creaming the wet ingredients together add to a mixer and start blending in dry ingredients, half of a cup at a time, until well blended. Beat at high speed for 5 mins. Place ingredients in a greased and floured bundt cake pan. Bake at 350 for 45 mins or until cake tester inserted comes out clean. 3. Make glaze: 1 1/2 cups powdered sugar, 1/2 We Olive Peach Balsamic vinegar. Pierce baked cake with a fork and pour in half of the glaze to soak into cake. When cake has set for 15 to 20 mins. Turn cake onto a serving plate and finish by brushing the cake with the rest of the glaze. Enjoy!